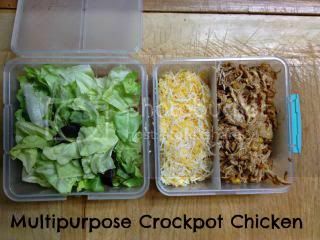 Crockpot cooking is an easy way to get a nice warm meal and I don't do it nearly enough. This week though, I experimented a little bit because I wanted Chicken Tacos on Tuesday and wanted to do the chicken in the crockpot. It was easy-peasy and delish! This recipe made enough for tacos for 4 people one night, chicken sandwiches for 2 people another night and lunch for 2 people for a few days. I cut each of the chicken breasts in half put the pieces in the crockpot. Add taco seasoning, arbol chili powder salsa and corn. Cover and let cook 8 hours on low (or 4-5 hours on high.) Shred with a fork and serve! Like I said, easy-peasy! Then you can do what you'd like with the chicken. The tacos were my favorite but even as a chicken salad it was great.